The Irish fortified house was a late medieval structure. In Ireland it was a transitional architectural genre reflecting the significant changes that occurred in Irish society in the latter sixteenth century and early seventeenth century. It drew on the earlier tradition of the tower-house and was influenced by the Tudor and emerging Jacobean architecture from England and the Classical and Military architecture coming from Continental Europe. The social, political and military changes that took place from the 1580s-1650s were to play a major role in the development of a unique Irish structure. Prior to the emergence of the fortified house castles remained important possessions amongst Ireland’s elite in the late sixteenth century. With the development of French siege artillery, castles had become obsolete for purely military purposes at the end of the fourteenth-century. Castles were still being built in Ireland, in the form of the 'tower-house' up until the seventeenth century. However, by the early seventeenth century, the alternative concept of the fortified house was being embraced by the Gaelic Irish, the Old English, the Gaelicised-English and Undertakers. The tower-house survived for so long in Ireland because it was a building that developed and functioned to meet the needs of the elite. It was a residence, a fortress and a status symbol, it grew out of the turmoil and break down of the fourteenth-century Anglo-Norman colony and it was an indigenous product born from existing models - the Anglo-Norman donjon, the early and later hall. Its decline coincided with the re-establishment of the colony in the late sixteenth century when the English administration slowly re-gained political and military control of Ireland, introducing a plantation scheme, greater security and new colonists. The introduction of Tudor architectural forms into Ireland was influenced by the influx of British settlers in the latter half of the sixteenth century, especially in the south of Ireland; a direct result of the Munster Plantation. Perhaps the most significant development in English architecture from the fifteenth to the seventeenth century was the decline of the medieval castle and hall in favour of the Tudor manor house. According to Klingelhofer (1997), some of these influences could be tracked to the English Court and to changes in royal policy and in families' access to power in the emerging nation state, i.e. the growth in power of an English merchant and bureaucratic class, and their access to the Crown. The revival in classical architectural forms in Italy, France, Spain and The Low Countries in the sixteenth century was also embraced by the English Court and its nobility. An English and mainland European movement at this time was the revival of Classical and Chivalric architectural themes. Architecturally the most noticeable late medieval trend was the widespread use of battlements and towers. This trend developed from the fashionable castellation in France and the Low Countries. In England, the use of battlements and corner-towers suggested a desire to follow up on this interest in French or Italian classical architectural style, but also a desire to project a quasi-military appearance from an earlier 'chivalric' age. Few, if any, of the English nobility retained any practical knowledge of military engagement, no large scale military ground combat had taken place on English soil from 1560-1640. To compensate, the English nobility expressed their power in castellated form, ‘they had their origins more often in the robe than the sword’ (Klingelhofer 1997, 150). In 1592 Walter Ralegh, a leading light of the Munster plantation, began to construct a house in Dorset, England. It was an oblong building with hexagonal corner-towers. This general plan, with round corner-towers had been used in south-west England since the mid-sixteenth century. The square corner-tower, probably a French design makes an appearance in England towards the end of the sixteenth century. Oblong residential buildings, with projecting corner-towers, square, round and octagonal was a recurrent theme in English architecture from the thirteenth to the seventeenth century. By the mid-sixteenth century these structures, cast in a para-military mould, had little or no defensive significance and were designed with aesthetics rather than functionality in mind. In Ireland, and specifically in Munster, most of the Planters originated from the English south-west. 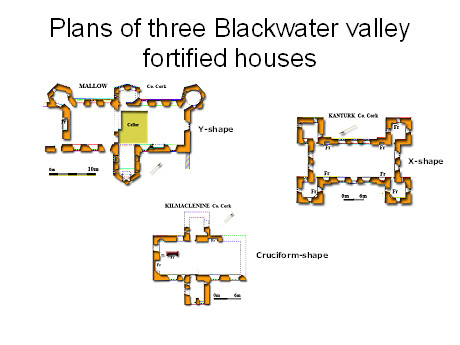 A few houses in the south-west of England were comparable in plan to the rectangular block with corner-towers, which was to become the basic plan for the Irish fortified house. Classical architectural designs reached Ireland in a variety of ways. Sons of the Irish nobility were educated abroad during the sixteenth and seventeenth centuries. Irishmen of means travelled to Europe often to join Continental armies or religious orders (Loeber 19!!). Many of the craftsmen, architects and architect-engineers involved in the design and construction of the Irish tower-houses would have possessed the necessary skills needed to design and build Irish fortified houses. The need and desire for effective defence continued well into the seventeenth century. Other external influences on Irish architecture were reinforced by the increased distribution of architectural publications. Richard Boyle, one of the most dynamic builders in early seventeenth-century Ireland, owned a booklet with hand-drawn designs of famous monuments. The first recorded collection of an architectural pattern book in Ireland was in the possession of Lord Conway, Co. Antrim. It was confiscated in 1641, during the rebellion.  The Molyneuxs, who were successively Clerks of the Royal Works, Master Gunners of Ireland, and Surveyors General, held a collection that consisted of 37 publications on architecture and fortifications (Loeber 1979). A number of architectural influences had a direct impact on the form and design of the Irish fortified house, which were mostly domestic, English, Scottish and continental in origin. In regional terms the fortified houses built in Munster had a distinct southern English look and feel about them, the result of contacts built up between both regions; politically through plantation-immigration and, economically, because of long time trade contacts with the port and fishing towns of Waterford, Cork, Kinsale, later Youghal and Baltimore. The social changes that took place in Tudor England were reflected in architectural form by the elites in that society and it was those same elites who spearheaded the Munster plantations. They were generally men of noble birth but not merchants; they viewed Munster as another region within a larger England although culturally different, dangerous and politically unstable. It was these men who introduced the initial architectural influences that initiated a new style and design of elite house building in Munster. The many gabled, oblong country manors with circular and hexagonal corner-towers were built in sixteenth-century south-west England and by the end of that century the square corner-tower was making an appearance as an import from France. These were the main design styles that became a vital part of Munster fortified house building many years later. Sixteenth- and early seventeenth-century Ireland was not an isolated backwater and there was much and varied contact between contemporary elite society and continental Europe. Classical architecture had been revived within Europe and its importance, beauty and elegance was not lost on the Irish nobility who had frequent contact with mainland Europe. Indeed, the fortified house did not completely leave behind its association with the tower house and actually incorporated many of the same defensive elements that were found on these into the fortified house, along with many similar building methods.